Our trained well water system plumbers are standing by to deliver a complete system you can rely on for years. Our team will size your pump according to your well to make sure you always have the water you need, when you need it. We don’t stop there . . . Kay Plumbing will bring the water line from your well to your home; hook up your pressure tank and all the necessary controls. We’ll even tie it into your existing or new plumbing! We partner with industry leaders in pumps, pressure tanks and controls to make sure that your water system will provide reliable service day after day . . . year after year. In addition to system installation, you can rest assured that our “24/7” service plumbers will be there to service and repair your system. Whether you need a new system or simply need your system tuned up, we will be there for you! Municipal water supplies are monitored for water quality by the municipality. Municipal water supplies are usually treated prior to distribution and consumption by consumers. Because water supplied by a public utility is regulated be the EPA and individual states, consumers of water supplied from a municipality can be quite confident that their water quality meets specific health guidelines. However, very few regulations exist to govern the quality of private water supplies. Typically, well water is required to be evaluated for microbiological contamination only at the time of installation. Some health departments have begun requiring microbiological testing when the property changes ownership. During routine operation, however, it is up to the owner to monitor and ensure the quality of their water supply. 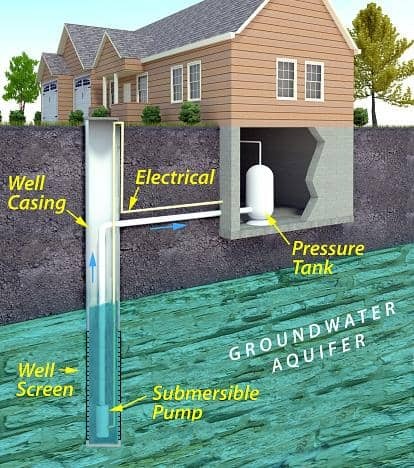 There are several basic tests that private well owners may wish to consider having performed on their water supplies to determine its quality. Many county health departments offer water testing, or you may want to consider using an accredited private testing laboratory. Microbiological testing should be performed annually to determine if any bacteria are present in the water supply. To determine impact of nearby agricultural operations or on-site septic system, private well users should have their water analyzed each year for nitrates/nitrites. A hardness test can be performed to determine if a hard water condition exists. Hard water can leave skin feeling dry, cause hard water deposits on shiny surfaces, and build up over time in appliances. The pH level of your water should be checked to determine whether your water is acidic. Water with a low pH (less than 7.0) may have problems with leaching of copper and lead from residential plumbing. Copper leaching will be indicated with a bluish-green stain; an analysis for lead will need to be performed to determine if lead leaching is a problem. If the area is known to have high arsenic levels in the groundwater, a test for arsenic concentration should be performed at least annually. If there is a gas station nearby (within a 1/4 mile), a BTEX and MTBE analysis should be conducted. This is a volatile organic analysis to detect the presence of gasoline and/or the gasoline additive MTBE. This analysis should also be repeated annually. If you live in a region of the country where radon is known to be a problem, have your water analyzed for radon. If radon is detected, homeowners may also want to have their indoor air analyzed for radon too. If you have a private well and live in an area where pesticide use is common, such as near a golf course, orchard, or agricultural area, you may also want to consider having your water analyzed for pesticides. The treatment of your water will depend on the result of your water quality analysis. Some water quality problems are better handled through point-of-entry applications, such as color and odor problems, or conditions such as hardness. Other contaminants can be best handled through point-of-use devices. Keep in mind that some treatment technologies may require that the homeowner pre-treat the water in order for the product to be effective. For example, reverse osmosis systems designed for arsenic or nitrate reduction will last longer if hard water is softened prior to entering the unit. In addition, arsenic can be present in water in two forms – if your water contains trivalent arsenic (Arsenic 3 or Arsenite), chlorination will be required prior to using a reverse osmosis system. If you decide to install a home water treatment device, it is important to ensure the system is installed and operated according to the manufacturer’s instructions. In addition, it is important to conduct follow-up testing of the treated water to ensure the system is working properly. The system may have to be adjusted depending upon its performance. Follow-up testing should be conducted several times throughout the first year of operation of the treatment system and after any adjustment made to the system. You should continue to monitor the quality of your well water at least annually, even if you choose not to use a home water treatment system. This continuing analysis will help you to determine if the quality of your water has changed during the previous year. If you installed a home water treatment product, the annual analysis will also help you to determine how your system is functioning and whether maintenance or replacement of components such as filter cartridges may be necessary. When selecting a water treatment system, it is important that you verify that the technology is safe and effective. One good way to ensure that water treatment products are both safe and effective is to use only certified water treatment devices. Certification by NSF to NSF/ANSI standards means that the manufacturer’s performance claims have been validated and that the materials used in the construction of the product have been determined by toxicologists to be safe for use with potable water. In addition, NSF ensures that the product literature is correct and not misleading. Through ongoing certification audits of manufacturing facilities and periodic retesting of the system, we also ensure that the water treatment products we certify continue to meet rigorous public health standards year after year.